All bidding is by invitation to prequalified bidders only. Bidders must be prequalified through Austin’s project specific prequalification process prior to the release of an Invitation to Bid(ITB). Processing prequalification applications can take over 30 days, submit your prequalification documents allowing for that processing period. The Early Release Package Enabling Work was bid and awarded in late 2014 and work is underway to clear the path for the remaining bulk of the project. In early February, plans will be available to Prequalified Subcontractors for the Ready Return Garage, Quick Turnaround (QTA) facility, the 1.4 mile Automated People Mover (APM) guideway, APM stations at the ConRAC Ready Return Garage, Economy Garage and the Terminal, as well as the Maintenance and Storage Facility (MSF). BP05 – Central Energy Plant – Mechanical contractors to provide proposals to construct CEP building turnkey. This includes but is not limited to all mechanical, controls, electrical, fire alarm, low voltage, security, plumbing, fire protection, concrete, masonry, steel, floors, framing and drywall, painting, finishes, fixtures, doors and hardware, windows and roof. Limits of work extend to five feet outside of building perimeter. BP13 – APM Station 1 (Terminal) – Austin Commercial to manage construction of APM 1. Trades are to provide proposals to supply and install scopes with the exception of the guideway, mechanical, electrical, plumbing, fire protection, elevators and escalators. This bid package includes but is not limited to the following trades: demolition, concrete, masonry, structural steel, decorative metals, floors, drywall, painting, ceilings, glazing, curtain walls, doors and hardware, specialties and roofing. BP14 – APM Station 2 (Economy Garage) – General Contractors to provide proposals to perform construction of APM 2. Scope includes supply and installation by all trades with the exception of guideway, mechanical, electrical, plumbing, fire protection, elevators and escalators. This bid package includes but is not limited to the following trades: demolition, concrete, masonry, structural steel, decorative metals, floors, drywall, painting, ceilings, glazing, curtain walls, doors and hardware, specialties and roofing. BP15 – APM Station 3 (ConRAC) – Austin Commercial to manage construction of APM 3. Trades are to provide proposals to supply and install scopes with the exception of the guideway, mechanical, electrical, plumbing, fire protection, elevators and escalators. This bid package includes but is not limited to the following trades: demolition, concrete, masonry, structural steel, decorative metals, floors, drywall, painting, ceilings, glazing, curtain walls, doors and hardware, specialties and roofing. BP16 – APM Station 4 (MSF) – General Contractors to provide proposals to perform construction of APM 4. Scope includes supply and installation by all trades with the exception of guideway, mechanical, electrical, plumbing, fire protection, elevators and escalators. This bid package includes but is not limited to the following trades: demolition, concrete, masonry, structural steel, decorative metals, floors, drywall, painting, ceilings, glazing, curtain walls, doors and hardware, specialties and roofing. BP17 – APM Guideway (including drilled piers) – Turnkey prime contractor to provide proposal to perform construction of elevated and on grade structure. Include drilled foundation system for guideway . Includes guideway at and through APM stations 1, 2, 3 and 4. BP18 – ConRAC/QTA Cast in Place Concrete – Turnkey prime contractor to provide proposal to perform construction of cast in place concrete for the garage structure, including helix ramps and CIP stairs. Excludes precast ramps and stairs. BP20 – Precast Structures – Turnkey prime contractor to provide proposal to perform construction of precast shuttler ramps and stairs. 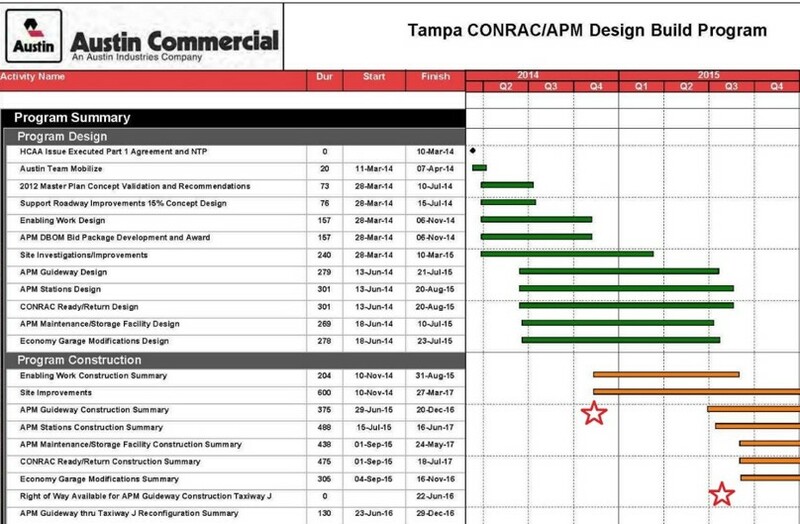 BP21 – ConRAC/QTA Finishes – Austin Commercial will manage the construction of the ConRAC/QTA buildout. This includes but is not limited to the following areas: RAC Administration building, electrical rooms, mechanical rooms, IDF rooms, stairwells, restrooms, CSB lobby and RAC lease areas. Scope includes supply and installation by all trades with the exception of guideway, mechanical, electrical, plumbing, fire protection, elevators and escalators. This bid package includes but is not limited to the following trades: demolition, concrete, masonry, structural steel, decorative metals, floors, drywall, painting, ceilings, glazing, curtain walls, doors and hardware, specialties and roofing. WMBE and other small business operators are encouraged to contact the prime contractors and other Prequalified Subcontractors (list available upon request) for opportunities to participate on a sub-tier level in the area of their construction specialty. This form has two parts, both of which must be filled out and separately turned in to the defined email address. If this form is not filled out in its entirety, you may not be considered as a subcontractor or supplier. Expect a 30 day processing period for your prequalification.